Celebrating the life of Dewey Lee Powell, Jr.
Be the first to share your favorite memory, photo or story of Dewey . This memorial page is dedicated for family, friends and future generations to celebrate the life of their loved one. Obituary for Dewey Lee Powell, Jr.
Dewey Lee Powell, Jr., 64, passed away peacefully on Tuesday, October 23, 2018 at his home surrounded by his family. Dewey was born in Wayne County on December 2, 1953 to the late Dewey Lee Powell, Sr. and Leila Casey Powell. He was a retired engineer with Firestone in Wilson. Dewey lived a life of dedication to his family and friends, and to his community. He served his community many ways as a member of the Goldsboro EMS and the Wayne County Relay for Life, and served as past president of the New Hope Ruritan Club. 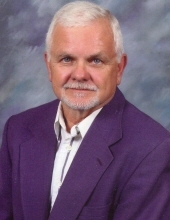 Dewey was a member of First Free Will Baptist Church where he served as a deacon and served as past president of the Wayne County Sunday School Association. Dewey was most comfortable outdoors and always enjoyed the opportunity to go fishing or to work in his garden. He will be remembered for his loyalty and dedication to, and deep love for, his family and his zest and love of life. The family will receive friends on Friday, October 26, 2018 at Seymour Funeral Home from 12:00 – 1:00 p.m. followed by a service to celebrate Dewey’s life at 1:00 p.m. in the chapel with Pastor Tony McLamb officiating. Interment will follow in Wayne Memorial Park. Dewey is survived by his wife, Denise M. Powell; daughters, Jennifer Powell and wife Lindsey of Wilmington and Karen Howell and husband Shawn of Fremont; granddaughter, Isabel Howell; and several faithful canine companions. Flowers are welcome or memorials may be made in Dewey’s memory to the Wayne County Relay for Life. To send flowers or a remembrance gift to the family of Dewey Lee Powell, Jr., please visit our Tribute Store. "Email Address" would like to share the life celebration of Dewey Lee Powell, Jr.. Click on the "link" to go to share a favorite memory or leave a condolence message for the family.